Awaiting trial at Archway Young Offenders Institution, Emily Koll is going to tell her side of the story for the first time. Heart-Shaped Bruise is a compulsive and moving novel about infamy, identity and how far a person might go to seek revenge. When Adamma Okomma has to leave New York for a dusty English boarding school, she thinks it's the end of the world - or the end of her social life, at least. But then she meets the wicked-witted Scarlett Chiltern, who shows her all Crofton College's darkest corners, and Adamma realises that there's much more to her new school than tartan skirts and hockey sticks. It's only been three months since Lola Durand's mother died, but her father has announced that he's marrying someone else and moving to Paris. She's horrified but has little choice but to go with him, but when she gets there, she quickly realises that his new wife has as much interest in being a stepmother as she has of being stepdaughter. Her father is too in love to see it, though, so when Lola finds out a secret about her, she can't wait to show him who he really married. 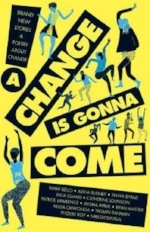 Featuring established YA authors and introducing a host of exciting new voices, this anthology of stories and poetry from BAME writers on the theme of change. My contribution, Hackney Moon, is a love story told from the point of view of Fate who conspires to bring two girls together. A unique collaborative novel by seven bestselling and award-winning YA authors: Sara Barnard, Holly Bourne, Tanya Byrne, Non Pratt, Melinda Salisbury, Lisa Williamson and Eleanor Wood. Curated by author, Juno Dawson, PROUD is a YA anthology of short stories and poetry by Lesbian, Gay, Bisexual, Transgender and Queer plus (LGBTQ+) authors set for publication in March 2019.